The right ink makes your stamped image look its best! Need an ink to mark on paper? Metal? Plastic? Wood? Food packaging? You've come to the right place! 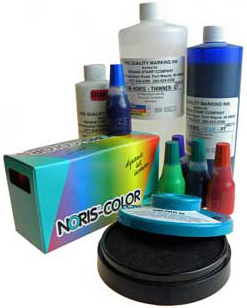 We carry a full line of Noris brand professional quality ink — inks to mark on nearly every surface and to solve a variety of marking challenges! Need help choosing an ink? Let us help! A non-hazardous ink for nearly all surfaces. Use with hand stamps, self-inkers, flash stamps, and metal stamps. General water-based stamp pad ink for inking and re-inking of office stamp pads and self-inkers. Invisible UV and visible UV ink for water and skin. Ink for marking directly onto meat. Child-safe, water-based ink complies with International guidelines for use in children’s stamps and games. Neon colored UV ink has a florescent effect, strengthened under UV light. Also safe for children's stamps. Colorful oil-based ink for paper. Characteristics allow it to go deep into paper making it nearly unremovable. Resin-free ink for archival documents and old books. For marking on natural textiles (not suitable for synthetics). Specifically formulated for marking on cheese rind. Inkjet ink for Drop On Demand printers. Good for most non-porous and porous surfaces. Can be removed by water on nonporous surfaces.